Who invented the Television? 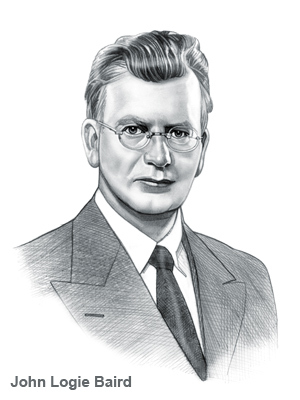 The name of the person credited with inventing the Television is John Logie Baird (1888 - 1946). John Logie Baird is not only famous as the Scottish inventor of the Television but also as a scientist, engineer and entrepreneur. Baird is often referred to as the "Father of Television". When was the Television invented? John Logie Baird invented the Television in 1926, during the Interwar period of invention (1918 - 1939). The invention of the Television originated in Scotland is considered a leading achievement in the field of Communications and Technology. Definition of the Television: Television is defined as a telecommunication system that converts and transmits stationary or moving images of objects and sound into electrical signals between distant points which are then displayed electronically on a screen. Fact 1: Who invented the Television? The Television was invented by John Logie Baird in 1926 during the Interwar Era of inventions (1918 - 1939) which was a momentous addition to advancements made in the area of Communications. Fact 2: Who invented the Television? Prior to the invention of the Television in 1926, there was movies and the radio but there were no 'live pictures' in the homes of people. Fact 3: Who invented the Television? The inventor of the Television, John Logie Baird, was born on August 14, 1888 in Helensburgh, Argyll and Bute, Scotland died on June 14, 1946. Fact 4: Who invented the Television? John Logie Baird was inspired to such an extent that he was destined to become esteemed as the Scottish inventor of the Television. Fact 5: Who invented the Television? The early years of John Logie Baird were spent in Helensburgh, Argyll and Bute, Scotland where he was raised by his family. His mother was Jessie Inglis and his father John was a church minister. Fact 6: Who invented the Television? John Logie Baird was a highly inquisitive, intelligent boy who loved cars and new technology such as telephones, the Radio and cameras. By the time he was 14 years old had made his own telephone and built a glider and then a generator using electric power to light the family house. Fact 7: Who invented the Television? John Logie Baird completed his education and studied engineering at the Royal College of Science and Technology. Fact 8: Who invented the Television? Following his education his first job was working in a factory but was determined to continue his interest in technology and inventions. He decided to set up his business selling medical products and invented a glass, rust-free shaving razor and established a shop selling various products including a soap he called 'Baird's Speedy Cleaner'. Fact 9: Who invented the Television? In 1922 John Logie Baird left London and settled in the small coastal town of Hastings in Sussex and began conducting experiments that he described as "a means of seeing by wireless [radio]". John Logie Baird had come up with this ground braking idea that would result in 'television'. Fact 10: Who invented the Television? At this time in history people listened to the radio and enjoyed watching moving images at the movies. However, there were no such thing as 'moving pictures' in the homes of people. John Logie Baird was about to change the lifestyle of people forever. Fact 11: Who invented the Television? John Logie Baird used items that were easily available items to house the TV unit such as boxes, glue, card, darning needles, lenses from bicycle lamps, sealing wax and biscuit tins. He used the motor from an electric fan to power spinning discs enabling 'mechanical picture scanning' with electronic amplification at the transmitter and at the receiver. Fact 12: Who invented the Television? His first, simple TV picture showed a cross cut out of card. An image of the cross was scanned using spinning discs with tiny holes. Flashes of light from the image came through the tiny holes. The flashes of light were changed into electric signals. The electric signals were transmitted to a second spinning disc with tiny light bulbs instead of holes. The light bulbs flashed resulting in the first fuzzy TV picture of the Maltese cross. Fact 13: Who invented the Television? John Logie Baird entered a partnership with a London cinema owner called Will Day. On 26 July 1923 John Logie Baird applied for his first patent for a system of transmitting views, portraits and 'Scenes by telegraphy or wireless telegraphy'. Fact 14: Who invented the Television? In January 1924, Baird made a public demonstration of his apparatus (TV) to representatives from the national paper, the Daily News and also the Hastings Observer were present. Fact 15: Who invented the Television? The simple image of the Maltese Cross was replaced by a ventriloquist's doll and then by a person. On March 25, 1925 he set up a three-week demonstration of the television at Selfridges department store in London. Fact 16: Who invented the Television? The first person to appear on TV was on October 5, 1925 when a 20-year-old office worker called William Edward Taynton. William Taynton was paid two shillings and sixpence to be used as the first human TV subject by the John Logie Baird. Fact 17: Who invented the Television? On January 26, 1926 John Logie Baird demonstrated his TV for the Royal Institution and a reporter for the London Times. The scan rate was 12.5 images per second. At this point of of his images were in black and white. Fact 18: Who invented the Television? On July 3, 1928 John Logie Baird introduced color television. The first color TV images were of flowers, strawberries, and a man in a red and white scarf. Fact 19: Who invented the Television? In 1927 John Logie Baird sent a long-distance television signal over the 438 miles from London to Glasgow through the phone line. Fact 20: Who invented the Television? Other inventors joined in the race to make a rival electronic TV system, notably Philo Farnsworth, Lee De Forest, Manfred von Ardenne, Vladimir Zworykin and Westinghouse Electric, RCA and Marconi-EMI. Fact 22: Who invented the Television? The invention of the Television progressed still further when in 1928 his company, 'Baird Television Development Company, Ltd' sent the first transatlantic transmission under the sea. Fact 23: Who invented the Television? On July 2, 1928 first American Television station (W3XK) began broadcasting. Fact 24: Who invented the Television? Baird's television cameras had a habit of catching fire during filming and disaster struck in 1936 when a fire at the London TV studio broke out. Much of John Logie Baird's equipment was destroyed and important papers were burned effectively allowing his rivals to take his prime position in the invention of television. Fact 25: Who invented the Television? BBC Television Service was launched November 2, 1936 but chose to use the Marconi-EMI television system. Fact 26: Who invented the Television? John Logie Baird continued with his pioneering work and on August 16, 1944 he demonstrated the world's first fully electronic color television. Fact 27: Who invented the Television? World War 2 (1939 - 1945) broke out and John Logie Baird turned his attention to working with the British government on radar and infrared night viewing devices. Fact 28: Who invented the Television? WW2 ended in 1945 but his work had taken a toll on the great inventor's health. John Logie Baird died of pneumonia at Bexhill, near Hastings in Sussex, on June 14, 1946. He will always be remembered as the invention of television.